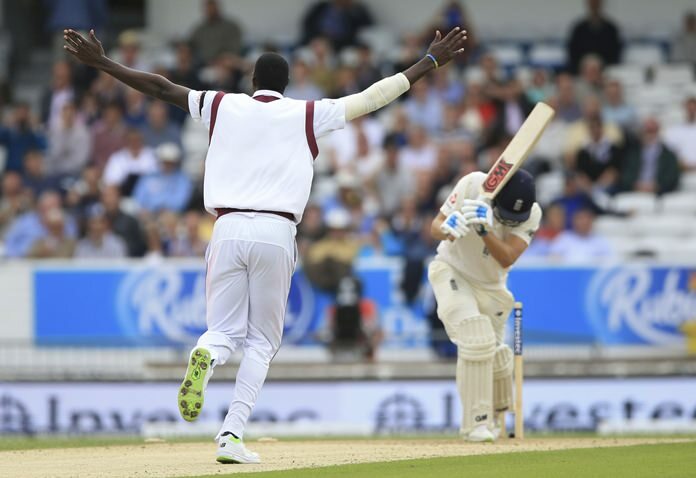 Leeds, England (AP) — West Indies bowled England out for 258 on Day 1 of the second test on Friday, raising hopes that the tourists can be competitive after a morale-sapping defeat in the series-opener. Quick bowlers Shannon Gabriel and Kemar Roach had four wickets each to lift West Indian spirits and restrict England, despite a century by Ben Stokes and a record-equaling half-century by captain Joe Root. West Indies were 19-1 in reply in their first innings at stumps at Headingley, 239 runs behind. James Anderson removed Kieran Powell for 5, helped by Alastair Cook’s 150th test catch. That took Anderson to 493 test wickets and edged England’s leading test bowler a little closer to becoming just the sixth player to 500 test wickets. Nightwatchman Devendra Bishoo kept Anderson and England’s attack at bay for 17 balls at the end of the day for his 1 not out. Kraigg Brathwaite was 13 not out. Despite the shaky start with the bat by West Indies, the day still belonged to the visitors, a surprise turnaround after they were beaten by an innings and 209 runs in the first test and expected to struggle again badly in the second. England’s decision to bat first was compromised by another failure by their new-look top order. Opener Mark Stoneman was out for 19 in his second test and No. 3 Tom Westley out for 3 in his second series. Alastair Cook (11) also failed, and England were 71-4 when Dawid Malan, another of the new batsmen, played on to Jason Holder on 8. It could have been even better for West Indies if Powell held onto a simple chance at slip when Root was on 8. Stokes also survived a chance when on 9. Having survived the drop, Root held England together with his 59, making a half-century in 12 consecutive tests and equaling the record of South Africa’s AB de Villiers. Stokes hammered 100 from 124 balls with 17 fours, sharing half-century partnerships with Root and Moeen Ali. That took England to a respectable total, but the outcome of the first day would have been pleasing to West Indies after seeing England rack up 514-8 declared in their only innings of the first test. Gabriel justified his recall to the team with 4-51, including the wickets of Cook, Stokes, and Jonny Bairstow. Legspinner Bishoo, another bowler brought back by the West Indies after missing the heavy defeat at Edgbaston, collected the wicket of Root.